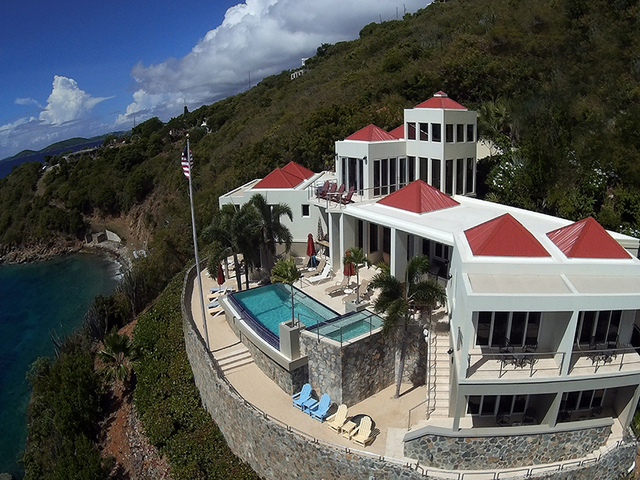 This uniquely styled villa which features an abundance of windows and sliding glass doors facing the fabulous ocean views allows for all of the natural beauty of St. John to be enjoyed in every room! 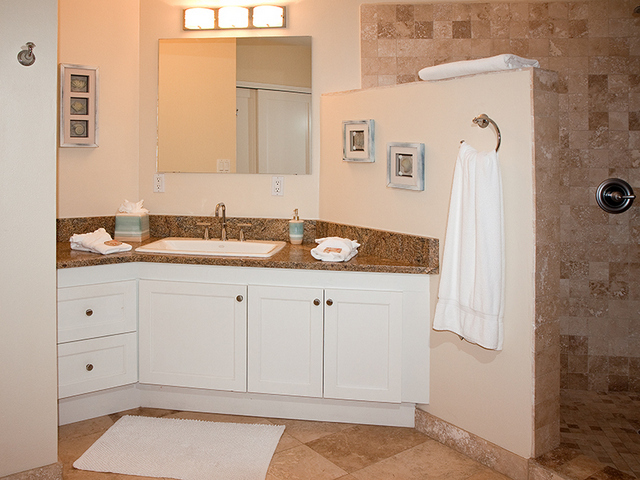 Native stonework provides a natural backdrop for a superb floor plan which provides privacy for all guests and lots of space for everyone. 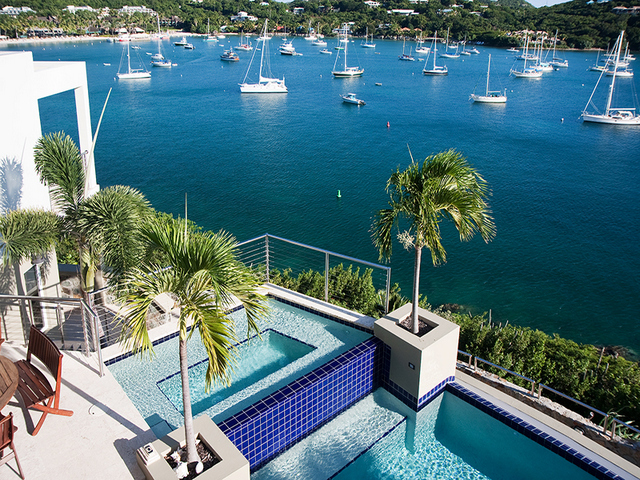 To create a special ambiance with nautical overtones, the use of high quality stainless steel railings constructed with stylish stainless steel yacht rigging is prevalent both inside and outside the villa. 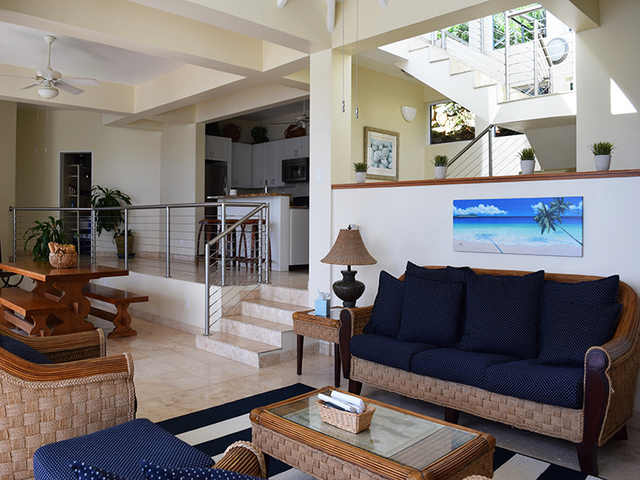 Combining stylish, modern architecture emphasized by the use of elegant travertine marble floors throughout together with all the requisite amenities of a superbly appointed luxury vacation villa, VI Friendship Villa is sure to please. 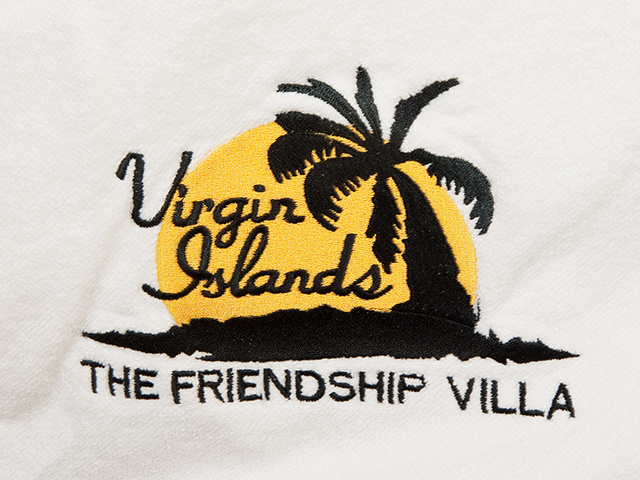 VI Friendship Villa is located at the end of a private driveway where guests will find an area large enough to park 2-3 vehicles directly adjacent to the front entryway. 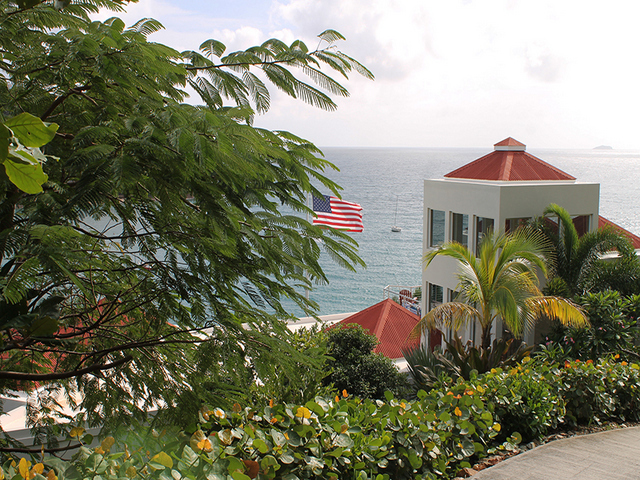 From the parking area, guests will descend several steps to the front door and enter the villa on the top most level. 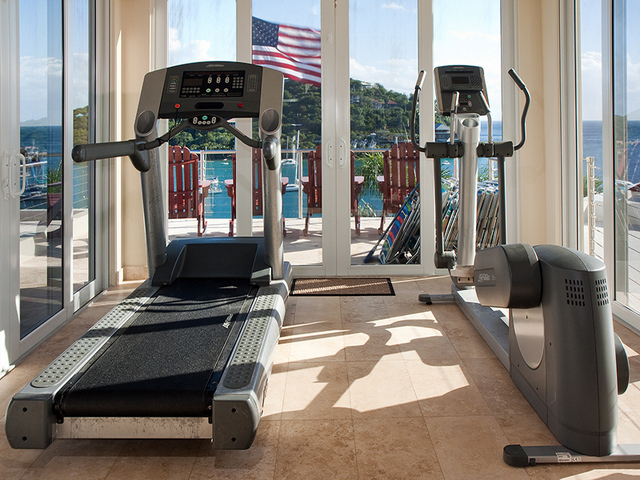 On this level is the fully equipped exercise room with treadmill, step machine, several weight machines and a complete free weight set. 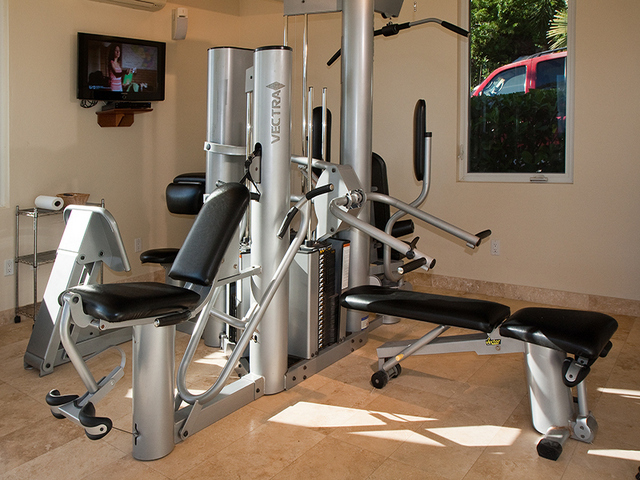 The exercise room also features two independently controlled air conditioning units and HDTV with HD satellite programming. 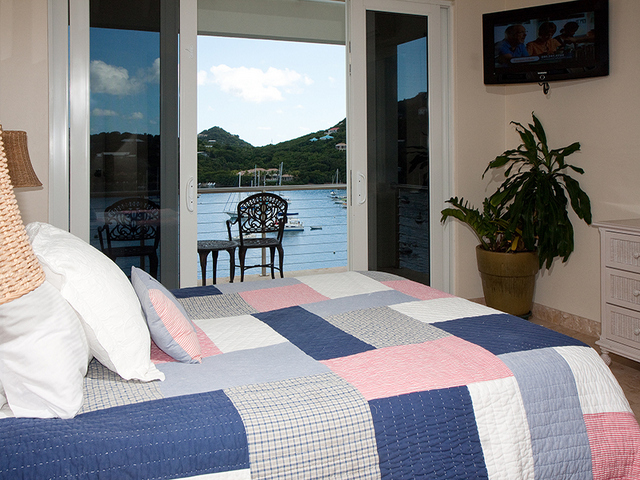 There are 3 sets of sliding glass and screen doors which allow fabulous views of Great Cruz Bay and the Caribbean and also allow cooling tradewind breezes to bathe the exercise room. 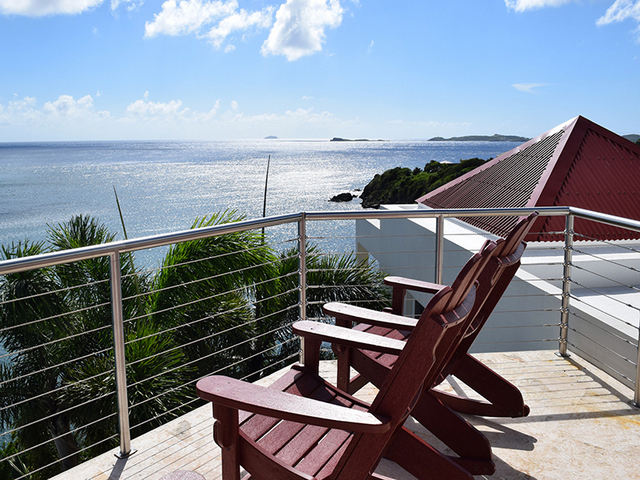 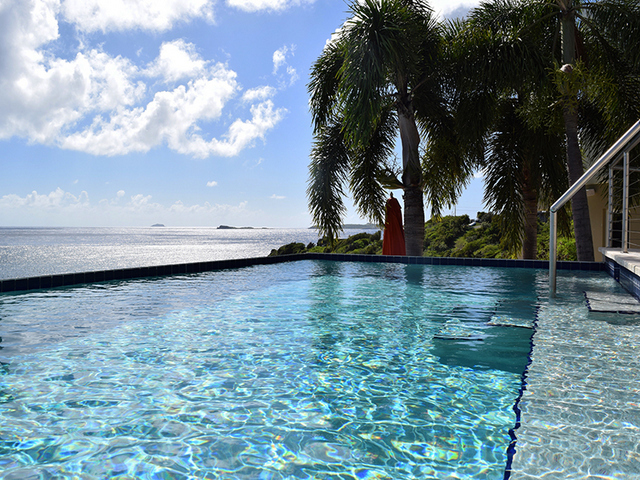 There is also a small viewing deck outside the exercise room which overlooks the lower levels of the villa as well as Great Cruz Bay and the fabulous Caribbean Sea! 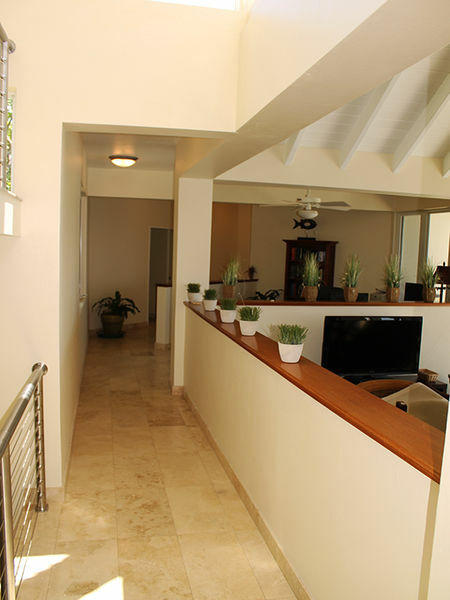 Descending a graceful tiled stairway to the second level will bring guests to the open and spacious great room and hallways to the bedroom suites and well equipped home office area located on this level. 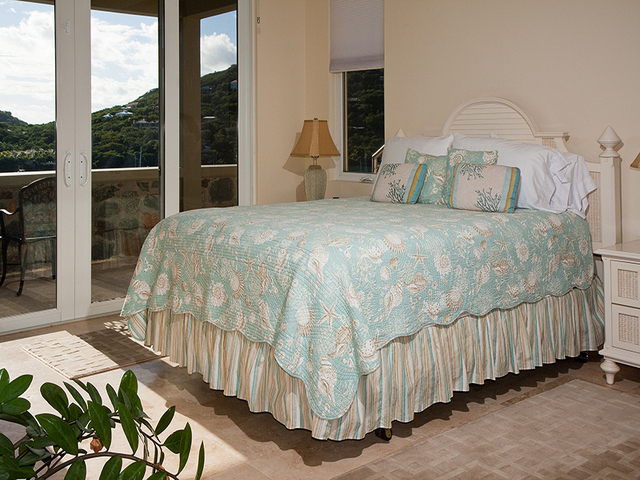 The villa features six equally-sized queen bed 'master suites' each with en suite bath, individually controlled air conditioning, 32" HD flat-screen with HD satellite TV, individually-controlled speakers from the main Bose sound system, coffee service, safe and private balcony - each with dramatic views of Great Cruz Bay and the Caribbean Sea. 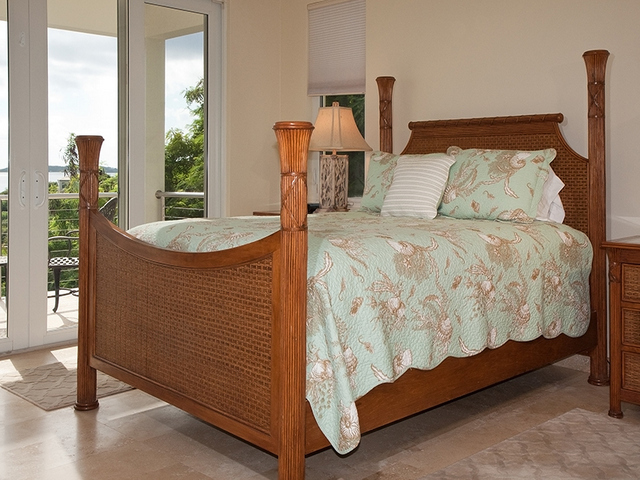 Two of the bedroom suites are located on the east wing and two others are located on the west wing of the villa. 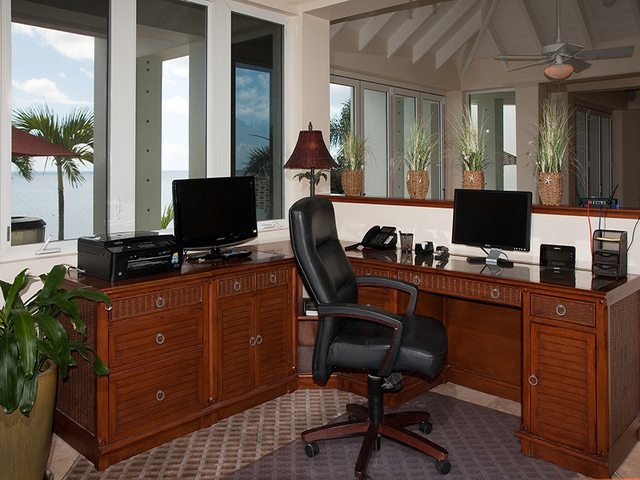 These four suites are separated by the fully equipped gourmet kitchen with granite counter tops, a pantry, a convenient powder room and office alcove which features a desk top computer with an all-in-one printer/scanner/fax and HDTV with HD satellite programming. 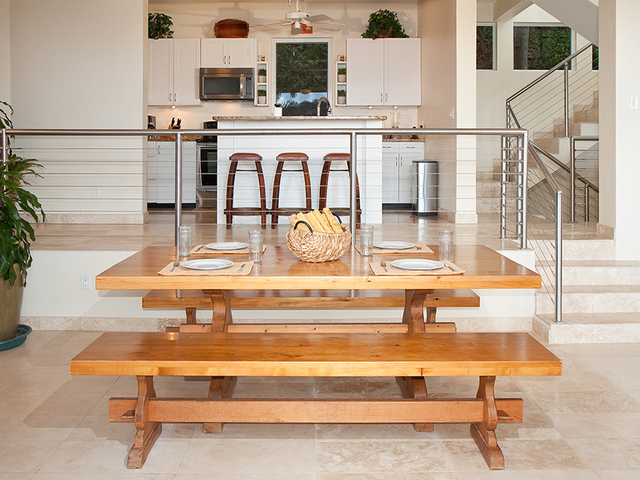 Four steps down from the kitchen is the dining area which features a large trestle dining table capable of seating ten people. 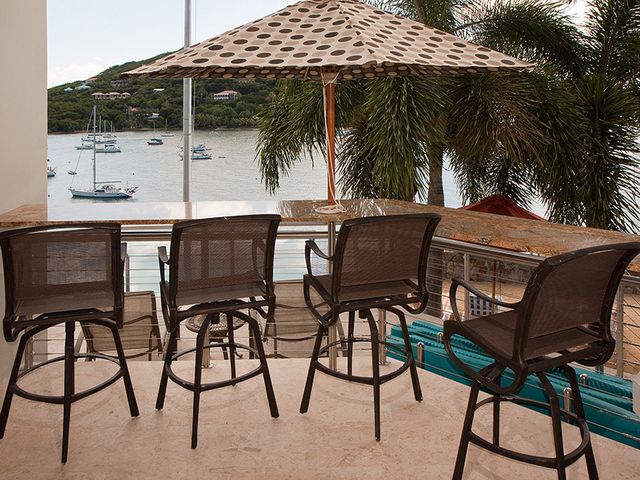 Through adjacent over-sized folding glass paneled doors, a granite counter with umbrella and 4 captain style stools are available to provide additional seating for large groups at meal times or for just sitting in the shade while basking in the beautiful ocean panorama. 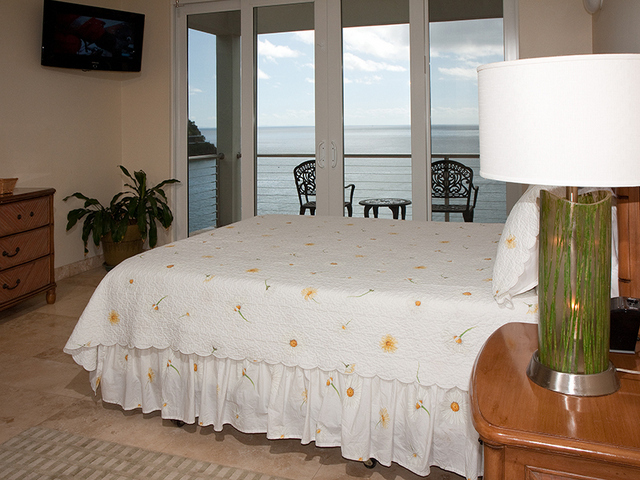 The adjoining great room area features a large comfortable couch and chairs and is equipped with a large, flat screen HDTV with HD satellite programming, a DVD player and a Bose Surround Sound system which sends music to speakers in all rooms, the pool deck and the bulkhead beach areas. 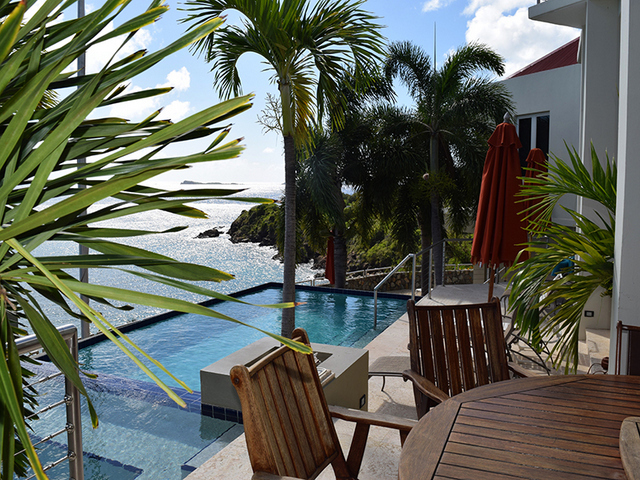 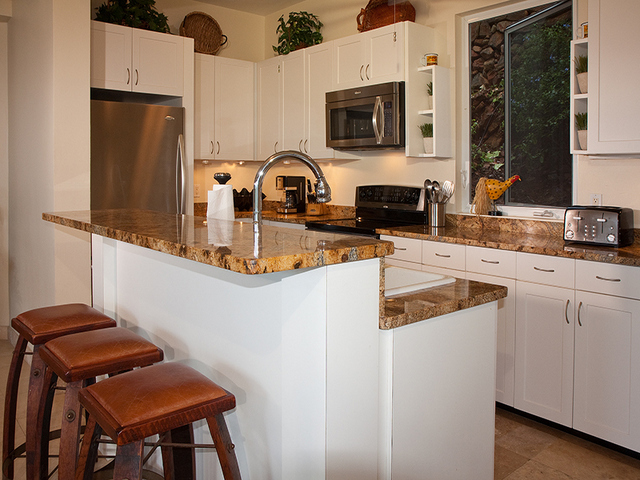 From this central location, wireless internet service is made available throughout the villa. 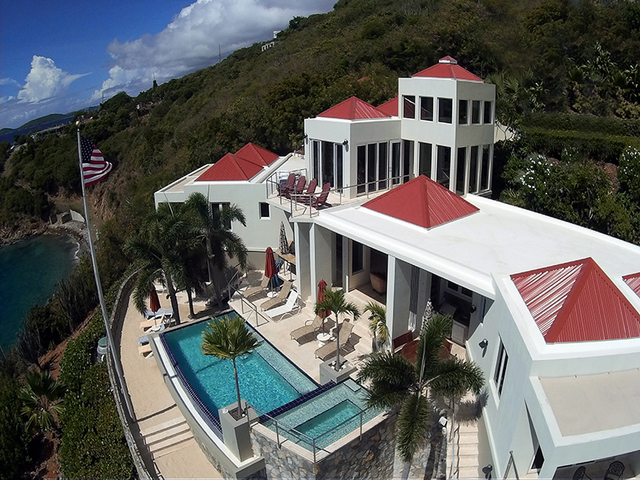 Over-sized glass-paneled doors fold open from the Great Room and lead out to the dramatic pool deck which features an infinity-edged pool, built-in hot tub and a sunning area with chaise lounges and umbrellas. 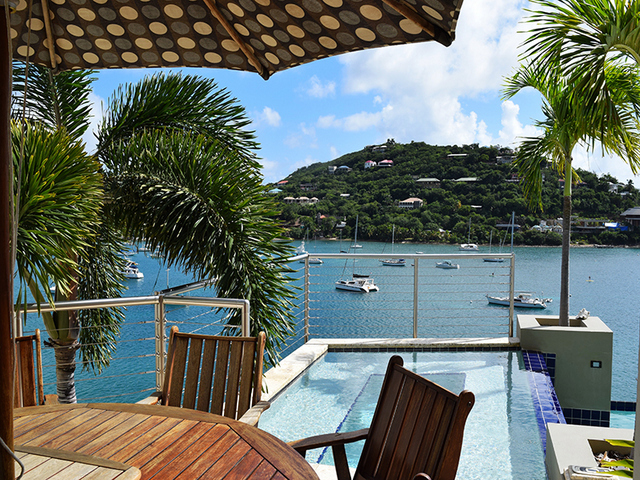 A focal point of the pool deck is a luxurious 6-foot round teak exterior dining table with comfortable seating shaded by an over-sized umbrella - just perfect for alfresco dining or relaxing in the shade by the hot tub. 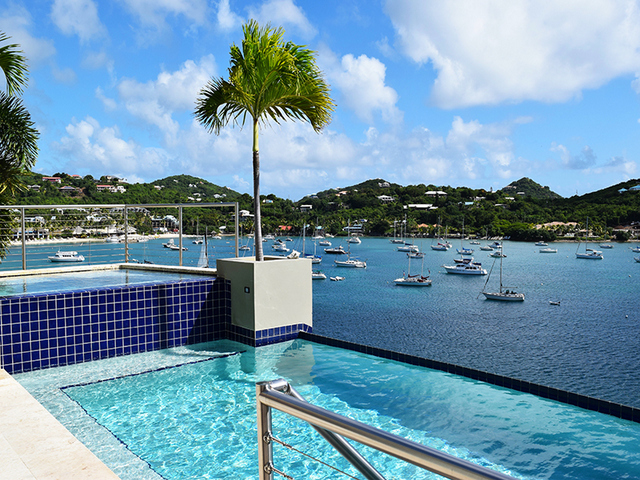 Completing the accoutrements on the pool deck is a large stainless steel gas BBQ grill, a commercial sized blender/smoothie machine, a wet bar and an ice maker. 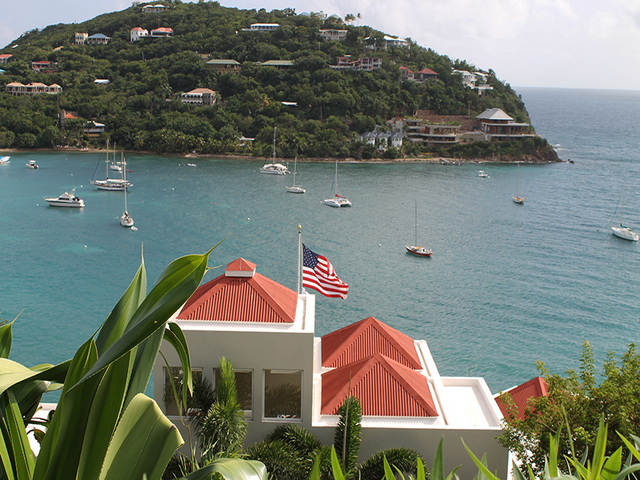 Create your own tropical libations or prepare your favorite grilled dishes while basking in the stunning views of the yachts at anchor in Great Cruz Bay, The Westin Resort's white sand beach across the bay and the glorious Caribbean Sea beyond! 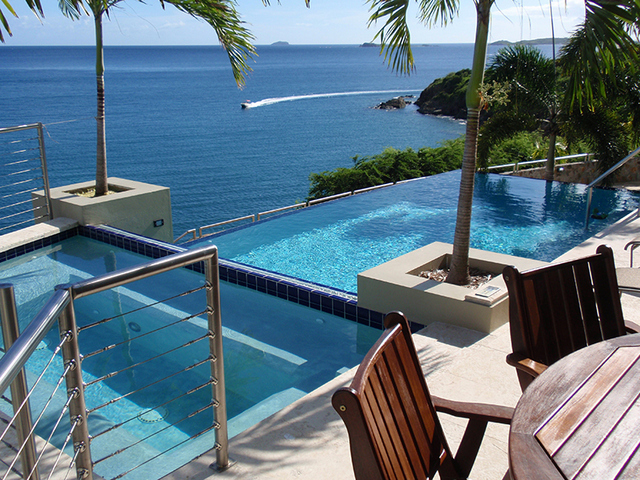 Connecting the pool deck to the lower level are two short staircases which descend to the bulkhead sand beach area. 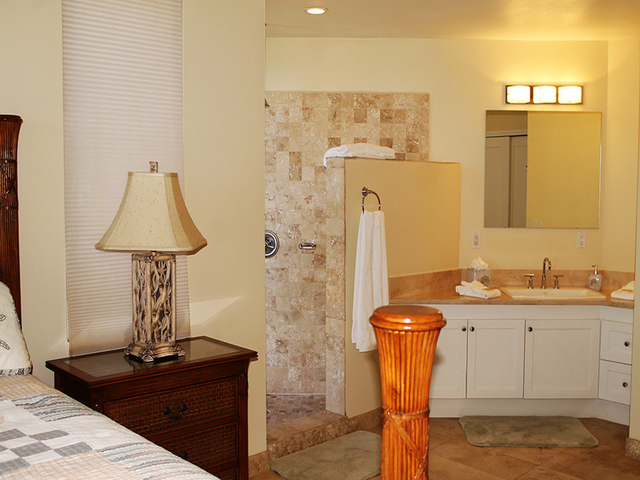 On the lower level of the villa are the other two master bedroom suites which are located adjacent to the guest laundry area and down the hallway from the game room. 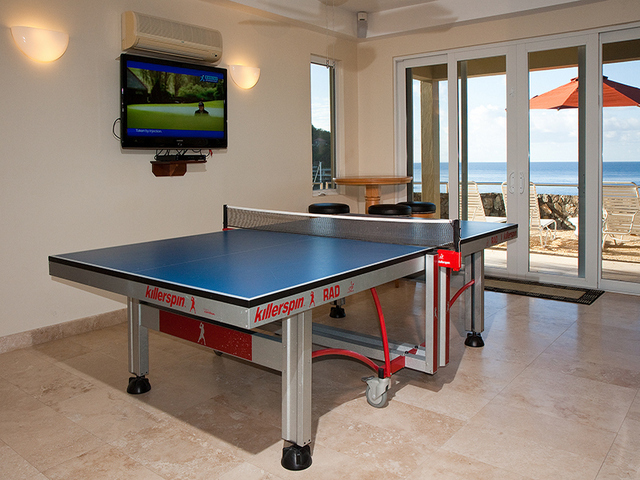 The game room is a large air-conditioned area with a large screen HDTV with HD satellite programming together with several game tables, numerous board games and an assortment of snorkel gear for guest use. 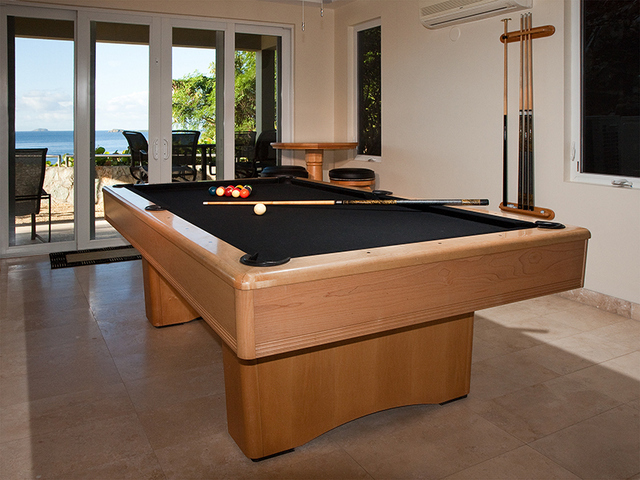 The primary features in the game room are a full sized ping-pong table and a regulation size pool/billiards table. 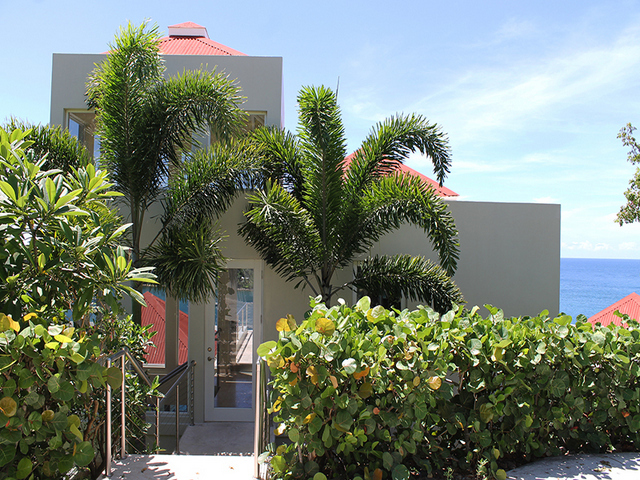 Immediately outside the game room through elegant sliding glass french doors is a covered veranda and the unique bulkhead sand beach flanked by palm trees. 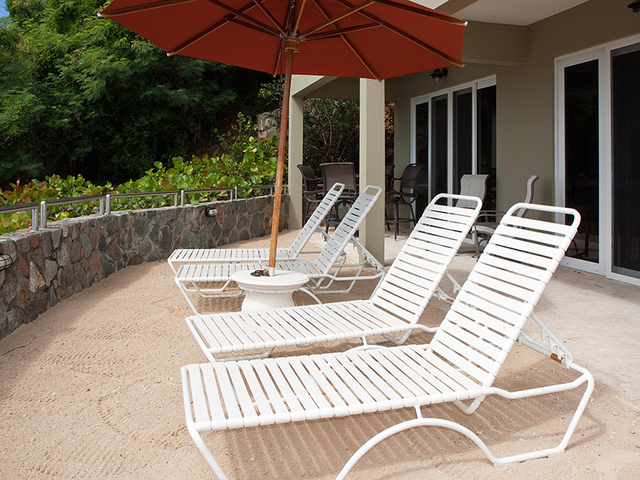 This one-of-a-kind feature is an area spread with white sand surrounding the pool deck and set with chaise lounges for basking in the sun. 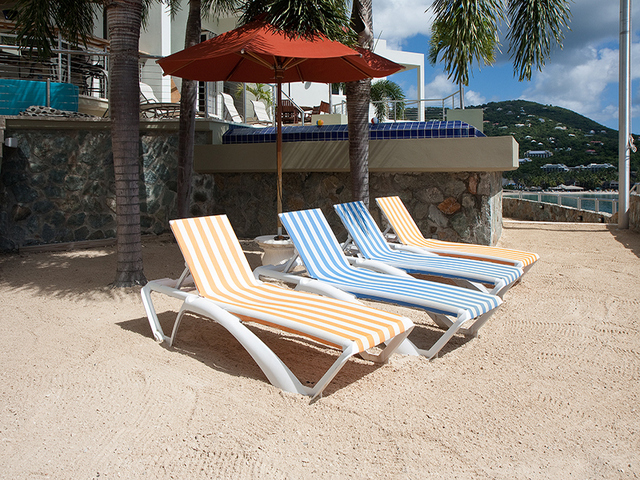 There is also a fire pit brazier on the beach for those 'cooler' evenings where you might sit around the fire with a favorite cocktail while watching 'shooting stars' in the nighttime sky! 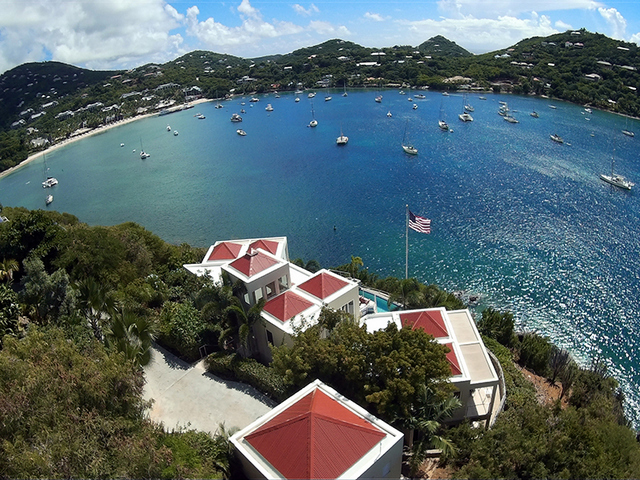 VI Friendship Villa provides over 10,000 square feet of very private luxurious accommodations conveniently located near Cruz Bay. 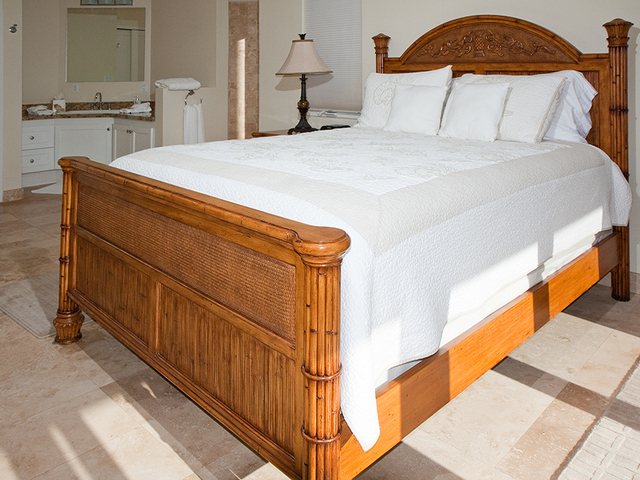 This beautifully-designed vacation space furnished with flair and comfort is sure to satisfy the most discerning traveler. 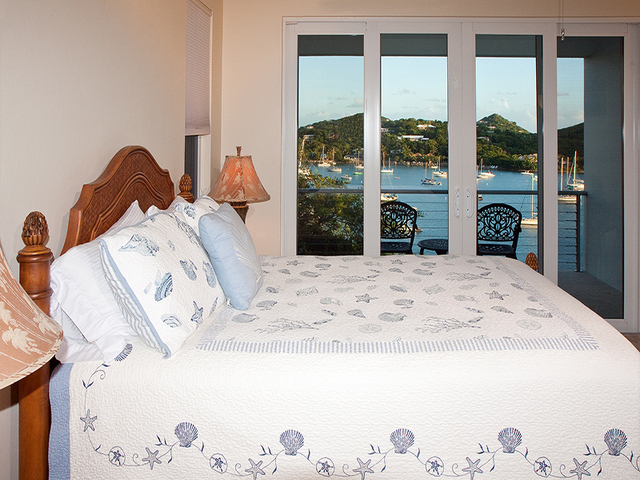 Come and experience all of the polished details which enhance the light and airy aura and unique character of VI Friendship Villa while enjoying beautiful St. John - you won't want to leave!